We’d love your help. Let us know what’s wrong with this preview of White by Angelina J. Steffort. When 18 year old Claire Gabriel meets Adam, her life takes a drastic turn. He seems to have stepped right out of a fairy tale, he shows this alien glow in his eyes, and he is beautiful – more than anything. On the way to discovering his secret, Claire soon finds herself in love with the mysterious boy. Unable to evade the dark shadow their feelings for each other draw up, When 18 year old Claire Gabriel meets Adam, her life takes a drastic turn. He seems to have stepped right out of a fairy tale, he shows this alien glow in his eyes, and he is beautiful – more than anything. On the way to discovering his secret, Claire soon finds herself in love with the mysterious boy. Unable to evade the dark shadow their feelings for each other draw up, Claire becomes a target in the the eternal war between good and evil; because Adam isn’t the only mysterious creature hovering around Claire . . .
To ask other readers questions about White, please sign up. Adam, Greg or Jaden? Who is your favorite and why? Mark A.M. Adam is an intriguing character for me, so far. I would need to continue reading more in order to write a more detailed answer. First off this book is truly captivating. Once I started I did not want to stop. The characters are so strong and mysterious, that it keeps you hooked from the first page. It really brings out many feelings, I laughed and cried reading this book. Now with that being said, there are many things in this book that confused me. The characters, backgrounds and information, always seemed to leave something extra that left me questioning many things. But I do hope to have my answers within the next two First off this book is truly captivating. Once I started I did not want to stop. The characters are so strong and mysterious, that it keeps you hooked from the first page. It really brings out many feelings, I laughed and cried reading this book. Now with that being said, there are many things in this book that confused me. The characters, backgrounds and information, always seemed to leave something extra that left me questioning many things. But I do hope to have my answers within the next two books in the trilogy. I really do not want to give anything away with my review because I feel that the added mystery really makes it all the more better of a read. I really love this book, and cannot wait for the next in the series. Check it out, you will not regret it! I was challenged by a friend to read at least one #YA (Young Adult) book as a "bucket-list" thing to do. Surprisingly, I have gotten really absorbed within the book from the very beginning. I really like how this story unfolds and I am enjoying the characters. I look forward to finishing this book and for the remaining books in this trilogy to be published. A Must-read for the fantasy genre! Things are not always as they appear to be. In this captivating fantasy, you will meet very realistic characters, captivated between bad and good. This is a passionate romance which is worth the read. White is a thoroughly entertaining tale of Good vs Evil. Claire and Adam are two young adults living ordinary lives. When they meet, Claire unknowingly becomes a catalyst between the forces of good and evil. People and events are not always what they appear to be. The ending came as a complete shock! I can’t wait to see what happens next. With Claire's parents gone, she is uprooted and moves to Aurora with her sister. Here, she finds a new fascination with graveyards and prefers to spend her time there. This is where she meets the good-looking Adam. There's something mysterious about Adam and it only draws Claire in closer. They have a connection that neither can explain, but it isn't instant love which I really liked. But Adam's has secrets that put Claire's life at risk. A secret that involves an old war between demons and angel With Claire's parents gone, she is uprooted and moves to Aurora with her sister. Here, she finds a new fascination with graveyards and prefers to spend her time there. This is where she meets the good-looking Adam. There's something mysterious about Adam and it only draws Claire in closer. They have a connection that neither can explain, but it isn't instant love which I really liked. But Adam's has secrets that put Claire's life at risk. A secret that involves an old war between demons and angels. WHITE is a captivating story with intriguing fantasy elements. I loved Adam's character and how he always has Claire's best interests in mind. I thought the way events unfolded were well written and sucked me into the plot. This review has been hidden because it contains spoilers. To view it, click here. Romantic and suspenseful. A total page turner and compulsive reading. Romantics will cheer on Claire and Adam’s impossible love just the way they hoped Anastasia and Christian’s relationship would prevail in Fifty Shades. However White is sweeter in tone and is set in a fascinating story world, where we wonder - what would it be like to fall in love with an Angel? The town of Aurora is an intriguing backdrop for the story and the characters are people you like. I’m looking forward to part 2. Angelina’s book captivated me! I really enjoyed the whole story. The characters truly come to life in this book. I can’t wait to start the second book. To start, this book was intriguing and very captivating. It’s been a while since I can say I’ve picked up a book that I could really get into and get excited about. Once I got started I couldn’t put it down. I only wished I had more time in my day to read. The characters, backgrounds locations all felt real, and vividly described. The feelings and emotions impressively well put together and eloquently structured. I was swept off my feet, glued to the pages at each romantic paragraph. In fact, I To start, this book was intriguing and very captivating. It’s been a while since I can say I’ve picked up a book that I could really get into and get excited about. Once I got started I couldn’t put it down. I only wished I had more time in my day to read. The characters, backgrounds locations all felt real, and vividly described. The feelings and emotions impressively well put together and eloquently structured. I was swept off my feet, glued to the pages at each romantic paragraph. In fact, I wanted to enjoy a cup of hot chocolate at a certain location, but I really don’t want to give away anything with my review. The story took me through so many emotions, I cried, laughed, and was angry, and even felt great loss and heartache. I was both surprised and amazed, but the emotion I mostly enjoyed was the great and powerful romance Claire and Adam both shared. In fact, I only wish there had been more to read. I’m dying for the next book in the trilogy. DNF around 75% through. Bummer. I just couldn’t bring myself to finish this book. Absolutely nothing happened in the first 100+ pages of the story...literally. There wasn’t even a whole lot of world building to make up for that lag. Even after Claire met Adam it went nowhere fast. Then by the flip of a page they’re madly in love with just a few cryptic words between them?! I mean I know it’s fiction but there was absolutely no connection or chemistry between the two! It felt very contrived to sa DNF around 75% through. Bummer. I haven't read many angel/demon-human romances. This, perhaps, keeps it fresh for me when I come across one. I was captivated by the story. I liked Adam a lot. Claire, not as much. She was immature, especially for the experiences she had gone through. She acted and made decisions that I would expect from someone younger or one who had been sheltered from life. I thought she accepted the angel/demon part too easily for one never exposed to it. Perhaps, it will come out in another part of the tril I haven't read many angel/demon-human romances. This, perhaps, keeps it fresh for me when I come across one. I was captivated by the story. I liked Adam a lot. Claire, not as much. She was immature, especially for the experiences she had gone through. She acted and made decisions that I would expect from someone younger or one who had been sheltered from life. I thought she accepted the angel/demon part too easily for one never exposed to it. Perhaps, it will come out in another part of the trilogy that she had some prior talks about angels with her parents or something. That would explain the ease of her not being alarmed by wings sprouting out of nowhere. The other people in the book are well written as is the setting. The plot was really interesting. I'm curious to see what happens next. The story could have wrapped up on its own, except for the final chapter. There are a few hints that there is more to come before the final chapter but nothing that would prevent it as being a stand alone. The last chapter about Edward, though, really opens up the for the sequel. If you hate cliffhangers, don't read the last chapter about Edward, until the next book is released. I like that this is a trilogy. It means it will wrap up quickly. These series with 25+ books kill me. I do think there may be potential for spin off books, depending on where the next two books take us. Spin offs I like much more than endless series. Don't get me wrong. I read a few of those 25+ series. I enjoy a very few of them greatly. It just is more likely that I get bored or think to myself, good lord what is going on in that small town! Are there any people left? Haha. This is a clean YA fantasy. I would have no problem gifting it to teenagers. I would recommend it to friends who like fantasy. I think it would make a good selection for a teen book club. 4.5 from me on this one. This is very much a clean YA. Young characters, clean story, and the cleanest purest love.This is the story of Claire, a young and very naive woman. Here lies my main issue with this book. Claire is 18 yet acts more like a maybe 14-15 year old. Even in light of some things that happen in her life, she acts more like she has led some kind of VERY shelter and protected life. I am curious how this will play out further on in the story. This is NOT a cliffhanger, yet is a se 4.5 from me on this one. This is very much a clean YA. Young characters, clean story, and the cleanest purest love.This is the story of Claire, a young and very naive woman. Here lies my main issue with this book. Claire is 18 yet acts more like a maybe 14-15 year old. Even in light of some things that happen in her life, she acts more like she has led some kind of VERY shelter and protected life. I am curious how this will play out further on in the story. This is NOT a cliffhanger, yet is a series. As in the story in this book ends, and yet the reader knows more is coming. 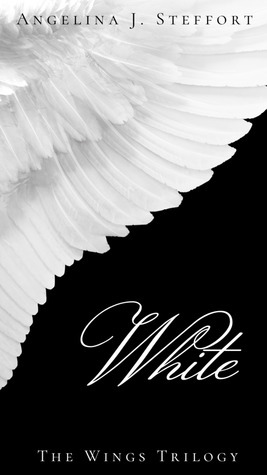 Sigh, I really really wanted to like White, but in the end, it was not a book for me. Insta-love, immature & questionable behavior, plus what appears to be 4 possible love interests for just one girl-- not very appealing. I did enjoy the settings (those were well written) and a few side characters, but it was not enough to make up for the rest of the book. I would have given this a 5 star but I felt the beginning was sort of drawn out in the first chapter, then I continued and started liking the story more. I did like the characters and the story line. I felt this could have been more and I am hoping it is in the 2nd book. A different type of Angels and Demons book and worth reading. W but different but a really great read! I was undecided at first as to whether I'd like the differences the author used about angels and demons (from other series along the same genre) but, after the first 2 chapters I was into this story. Loved the idea of angels feeling their souls mate even tho that person hasn't been met as yet. Also, the idea of a supernatural who seems a bit vulnerable is somehow appealing to me. So much so that I bought the 2nd in this series immediately after finishing t W but different but a really great read! I gotta say that I fell in love with Adam, but I didn’t really like Claire that much, she seemed a little heartless.. I felt like she didn’t really express how she felt.. And when Adam was killed, I was heart broken, but then when I read the last page I couldn’t wait to read the next book to see what happens next.. I was totally captivated by the world that unfolds in this wonderful novel which starts off in such an ordinary, normal setting and then continues on to quite literally grow wings. I'm already looking forward to the sequels to be able to immerse myself once more in Claire's universe! A great story line. I love it so much. Recommended one! I love this romantic story. Highly appreciated to author for excellent gift. Yes, this was awesome story that hooked me start to end. I just wonder about, how author drawn Claire Gabriel and Adam plot with great ending. Thumps up. I love this romantic story. It's twist taste hooked me to read until finish. Highly recommended. True love! Found early in life by souls meant to be entwined throughout eternity. Mates forever, only to be toyed with by demons hoping to rip souls apart. I loved it, though despaired at the ending. Like the protagonist, I was in denial up to the end, then it was over. UNTIL I was left with a sprinkling of hope! This book was intriguing. The characters, some of them at least were a bit undefined. Hopefully the next book in the series will catch up, give a deeper look into what they mean to the final story. I really detest cliffhangers. I look forward to the next few books. This book is a must read for all fantasy fans. At first I thought that it was just another angle story but then I was captivated. I stayed up all night just to finish this book. "Chocolate fanatic, milk foam enthusiast and strict fan of the southern sting-ray. Writing is an unexpected career path for me." Bestselling author Angelina J. Steffort was born on February 28th 1984. She has multiple educational backgrounds, including engineering, business and music. Angelina writes YA fantasy and paranormal romance and is the author of The Wings Trilogy , currently working on the third part. Her debut novel White was released in April 2017.